A parliamentary report of 1777 recorded local workhouses in the Carlisle parishes of St Cuthbert's (one serving the Botherby, Botchergate & Carleton Quarters for up to 12 inmates; another serving Briscoe, Harraby & Upperby Quarters for 7 inmates), St Mary's—Caldewgate Quarter (20 inmates), and St Mary's—Rickergate Quarter (10 inmates). Workhouses were also listed at Rockcliffe—Castle Town Quarter (8 inmates), Rockcliffe—Church Town Quarter (8), Stapleton—Stanwix Quarter (2), and Weathereal Parish (12). A few years ago a Workhouse was erected for £1,000. It belongs to Carlisle, but 13 adjoining parishes send their Poor thither. The proprietors are entitled to all earnings, but very little work is done, as few that can work will come in. The amount earned between Aug., 1793, and July, 1794, was £20 9s. 4d. A set of rules is provided for the management of the Workhouse, whereof the tenth and eleventh are as follows: A committee of three shall visit the house once a week, inquire into the management of the master and mistress, and hear the complaints and grievances of the Poor, who are hereby requested to take notice that for every frivolous or unjust complaint made by the Poor, of or against the master or mistress, they will be most severely punished. Those regulations shall be read over to the Poor once a week, who shall be assembled for the purpose, and their names called over that none may pretend ignorance. On the ground floor of the Workhouse a dungeon is provided for the confinement of the refractory. The table of diet is as follows: Sunday, Wednesday—Breakfast—Hasty pudding and milk or beer. Dinner—Broth, beef and bread, with beer. Supper—Bread and broth. Monday and Thursday— Breakfast—as on Sunday; Dinner—Potatoes, mixed with a little milk and butter, broth, bread and beer ; Supper—Hasty pudding or boiled milk and bread. Tuesday—Breakfast as on Sunday; Dinner—Boiled milk and bread; Supper—Hasty pudding and milk or beer. Friday—Breakfast as on Sunday; Dinner—2 slices of boiled beef and soup; Supper—Bread and broth. Saturday—Breakfast as on Sunday; Dinner as on Tuesday; Supper—Bread, cheese and beer. On Christmas Day the paupers are allowed roast mutton, plum pudding, best cheese, and ale. Since this institution was finished, it has produced a very considerable saving to the parish, principally by discouraging applications to the parish, for although it is certain that in the Workhouse the Poor are far better provided with the important necessaries of food, clothing, habitation and fuel than they could be by their most industrious exertions at home, this mode of receiving parochial relief is universally disliked; many distressed families prefer the chance of starving among friends and neighbours in their own native village to the mortifying alternative of being well fed, well lodged, and well clothed in a Poorhouse, the motley receptacle of idiots and vagrants. There are in the house 18 Poor belonging to the city, of whom 2 are under 12 years of age, and 20 from adjoining parishes, of whom 5 are under 12. There are also 32 paupers, including 4 bastards, receiving parochial relief outside the house. In 1809, St Cuthbert's parish erected a workhouse which was known as Harraby Hill House at a cost of about £4,000 including furniture etc. It was a large square stone building, stands on an acre of ground, which was purchased many years earlier with a bequest of £20 and money from the parish. 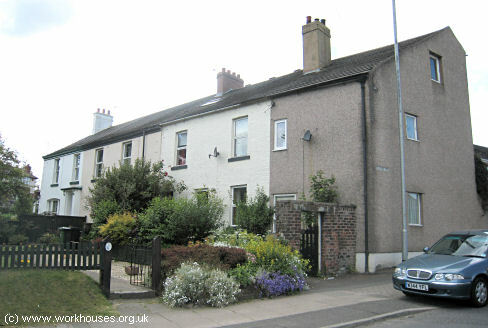 Caldewgate parish followed with a workhouse on Coal-fell Hill, Belle Vue, built in 1829-30 at a cost of £750. It was a plain brick structure and was extended in the 1840s to accommodate 130 inmates. The former Caldewgate workhouse, 2009. 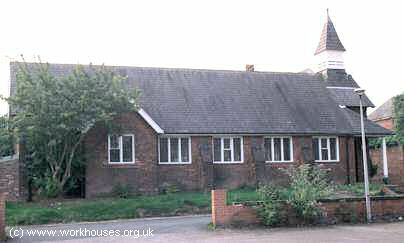 The parish of Dalston erected a workhouse in 1827 about a mile to the south of Dalston village. The building was designed by Thomas Martin of Dalston. According to an 1829 directory, it was built "on an allotment granted for that purpose by the Commissioners, at the enclosure of the commons in 1803. It is a large and convenient structure, with offices for the use of the Select Vestry, and cost about £500 which was raised by a rate levied on the parishioners. In November, 1828, it contained only 17 inmates." Dalston former workhouse site (plot 329), 1862. The parishes of Warwick and Wetheral (sometimes spelled Wetherall) operated a joint workhouse on Holme Lane, to the west of Aglionby. The former Wetheral workhouse, 2009. Cumberland: Beaumont, Burgh-by-Sands, Carlisle—St Mary's Rickersgate (2), Carlisle—St Mary's Caldewgate (2), Carlisle—St Mary's Cummersdale, Crosby-on-Eden, Dalston (2), Grinsdale, Kirkandrew's-on-Eden, Kingmoor, Orton, Rockcliffe, Stanwix, St Cuthbert's-within-Carlisle (2), St Cuthbert's-without-Carlisle (2), Warwick and Aglionby, Weatherall (2), Wreay. Later Additions: Belle Vue (from 1894), Botchergate (1894-1904), Eaglesfield Abbey (1862-1904). The population falling within the union at the 1831 census had been 35,027 with parishes and townships ranging in size from Kirkandrew's-on-Eden (population 107) to Carlisle St Cuthert's (9,449). The average annual poor-rate expenditure for the period 1834-36 had been £5,752 or 3s.3d. per head of the population. Like many other northern manufacturing areas, Carlisle found it difficult to operate the "workhouse or nothing" principle of relief enshrined in the 1834 Poor Law Amendment Act. In 1839 and 1840, slumps in the local textile trade could lead to 450 handloom weavers suddenly in need of relief. This was more than the workhouse could cope with and would anyway have been very expensive for the Union - the cost of keeping someone in the workhouse was much more than giving them modest out-relief as either food, or as a small cash payment. The weavers themselves were far from being totally destitute. What they wanted was short term relief which would allow them to continue with what little employment there was until times gradually improved. In response to this dilemma, the Poor Law Commission allowed the Carlisle Guardians to operate an "outdoor labour test". This allowed the giving of relief to the able-bodied so long as they were prepared to undertake hard manual labour such as stone-breaking in a specially set up labour yard. Few were prepared to take this option and tried to scrape by as best they could. The plight of the weavers led to the setting up of charitable "relief committees" funded by local citizens. 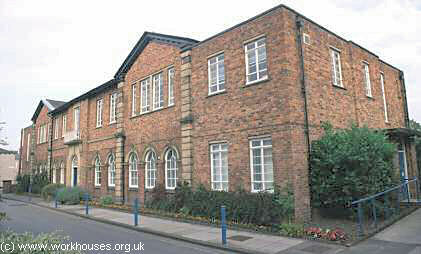 In 1863, the union erected a new purpose-built workhouse on Fusehill Street in Carlisle. After the new building was opened, St Cuthbert's workhouse at Harraby Hill was kept in use for the accommodation of children, while St Mary's and Caldewgate were disposed of. St Mary's later becoming Brown's Laundry and Dye Works, now demolished. Caldewgate later became St Mary's Home for Friendless Girls and was subsequently converted to private housing. The design of the new workhouse was opened to competition and attracted fifteen entries. The winning entry was designed by Henry F Lockwood and William Mawson of Bradford who were the architects of other workhouses in the north of England including those at Barnsley, Bradford, Dewsbury, Haslingden, North Bierley, and Penistone.. The new Carlisle workhouse accommodated 478 inmates and cost £11,195.15s. Its location and layout can be seen on the 1901 OS map below. The building consisted of a long three-storey main block. To its rear was a single-storey dining-hall which originally also served as a chapel. Carlisle main block from the south, 2001. Carlisle dining-hall and rear of main block from the north, 2001. The originally entrance to the site was from Union Street (now Broad Street) at the west of the site where the workhouse lodge and reception block were situated. Carlisle reception block from the north-east, 2001. The workhouse infirmary was located the west of the site. Carlisle infirmary block from the north-west, 2001. In 1901, a separate chapel was erected to the north of the infirmary. Carlisle chapel from the west, 2001. From 1904, to protect them from disadvantage in later life, the birth certificates for those born in the workhouse gave its address just as 2 Broad Street, Carlisle. Fusehill served as a military hospital during both World Wars. During the 1920s was known as Fusehill House Poor Law Institution then in 1930 was renamed Fusehill House Public Assistance Institution. With the introduction of the National Health Service in 1948 it became the City General Hospital, with the former workhouse infirmary becoming the City Maternity Hospital. Following the closure of the hospital in the 1990s, the refurbished buildings now form the University of Cumbria's Fusehill Campus. 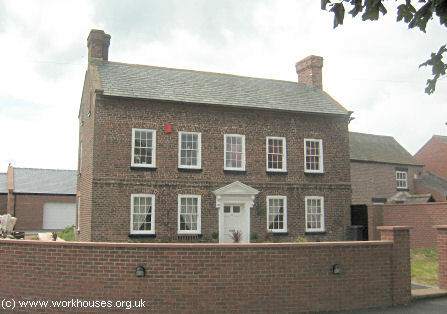 After the opening of the Fusehill Street workhouse, the former St Cuthert's workhouse was coverted for use as a home for the union's pauper children, known as Harraby Hill House. Carlisle Harraby Hill site, 1870. Boys at Harraby Hill House could join a military-style band. 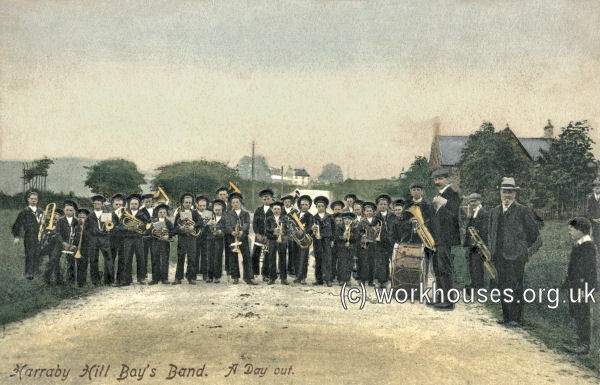 Harraby Hill House boys' band, early 1900s. © Peter Higginbotham. 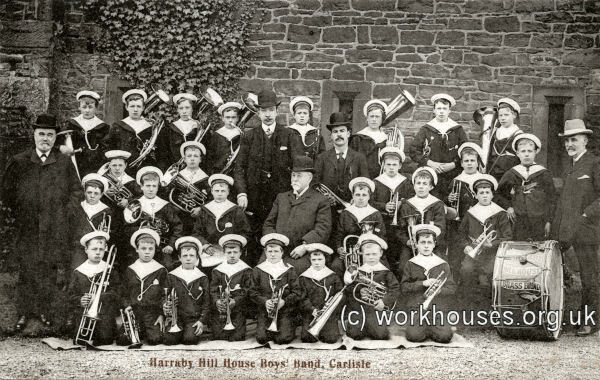 Harraby Hill House boys' band, c.1907. © Peter Higginbotham. 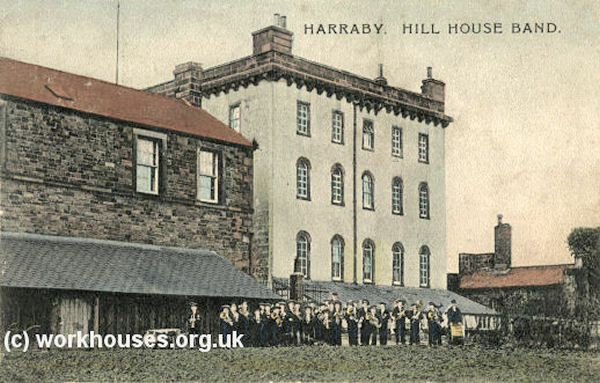 A British Railways hostel later stood on the Harraby Hill site which is now occupied by a modern hotel. In 1924, the union established a new children's home in the former West Ward Union's workhouse at Shap. 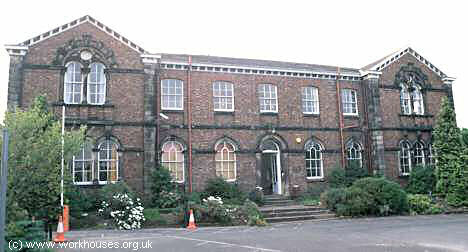 Carlisle Archive Centre, Lady Gillford's House, Petteril Bank Road, Carlisle CA1 3AJ. Limited holdings include Guardians' minutes (printed, 1897-1930).